In Mumbai, where I lived back when it was called Bombay, this simple dessert showed up at festive occasions. Weddings, naming ceremonies, and other happy family occasions were sweetened with small servings of shrikand. It’s easy to make, requires no cooking, and keeps well when refrigerated. It also looks very exotic with its deep yellow color and saffron scent. Sprinkle saffron over 2 tablespoons of very hot milk for 20 minutes. Soak raisins in warm water for 20 minutes. Mix yogurt and sour cream (plain American non-fat yogurt is much tarter than Indian yogurt, and doesn’t have the right texture). Beat in sugar, cardamom, and the saffron with its milk. Drain raisins and add to the mixture. This makes 6 servings, with virtually no fat/serving. Variation: This dish is often served with pistachio nuts mixed in. 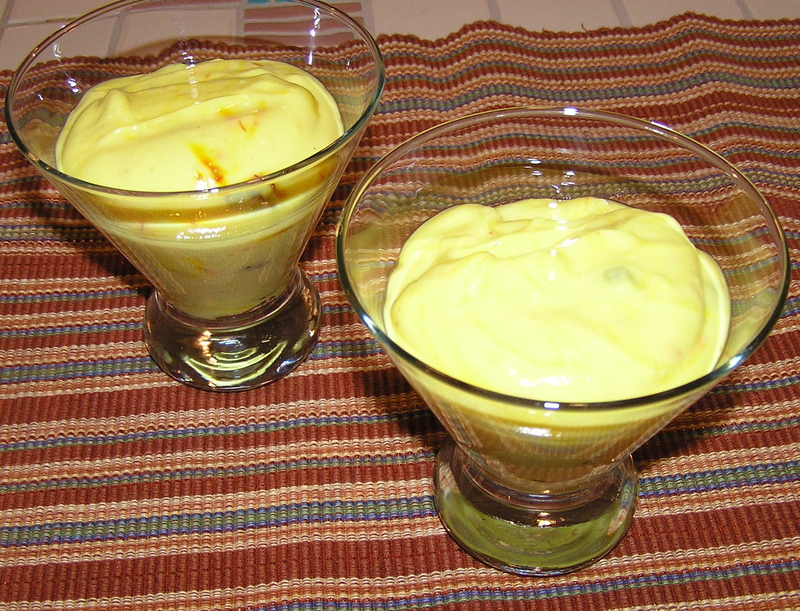 Kesar pista (saffron pistachio) is a very popular flavor in western India. You can add a quarter of a cup of chopped unsalted toasted pistachios to the mix (or sprinkle them on top of each serving).This will make your servings about 3 grams of fat. Variation 2: Instead of the cardamom, add a tablespoon of rose water.